With thousands of enthusiastic participants every year, the Write_On Campaign has grown from 30 days of letter-writing in April to a year-round letter-writing hub found at writeoncampaign.com. But so much of the action happens during April, and we want you to participate by hosting your own letter-writing event! Why should I host a Write_On event? For stationery and gift shops, many of your customers are avid letter-writers already. Hosting a letter-writing event is a great way to give back and get to know them! Social letter-writing is fun and easy to facilitate as well - you can throw an event together in no time. Letter-writing parties provide great visual content for Facebook and Instagram, and showcase your involvement in the letter-writing movement as well. Purchase a Write_On Party Pack! Write_On has 2 Party Packs to select from this year, so you can cater your party to your specific audience. Letter-writing party - Invite your customers to an evening of letter-writing together. Set up decorating stations, treats, giveaways or a raffle, and a special discount for the evening. Hand-lettering party - Host a local calligrapher or artist to give a demonstration on hand-lettering or envelope decorating. Charity letter-writing - Choose a local organization, or choose one from our Resources page, and spend the evening writing letters to those that might need a bit of cheering up. Political letter-writing - Create an event focused on writing political letters, either local or national. You can print up lists of representatives and their addresses before the event as well. Letter-writing materials swap - invite your participants to bring their favorite envelopes, vintage stamps, stickers, cards, washi tape, diy materials… and share and swap! For more ideas, peek at our Events page. Last year’s events are still up for your reference! How can I get folks to attend my event? What do you need from me to post our public event on the Calendar? Please send your info to write_on@eggpress.com. All community events will feature the disclaimer: This is a Write_On community event. Please contact the event host with any questions. Can I host a party for more than 10 people? Yes! Some options are to purchase multiple party packs, or to purchase additional Write_On kits for additional participants. You can also open the Write_On packs and have stacks of cards rather than individual kits for each participant. Offering a special discount on cards and stationery the evening of the event can increase sales and also help get more folks writing at your event. Are kits available wholesale? Can I resell the Party Pack items? Write_On products are not available at wholesale prices, and neither the Write_On kits nor the items in the Party Packs are intended to be resold. We hope in the future to have a more robust program for our retailers, but to keep the program sustainable we have needed to narrow the focus and offer Write_On products directly to consumers. 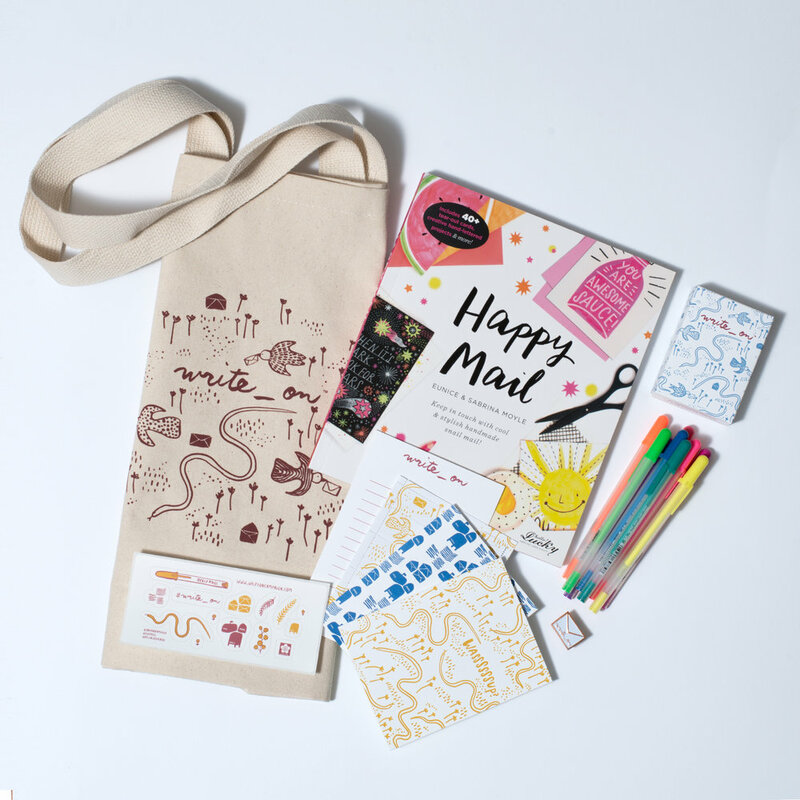 The Party Packs are a turnkey product to hosting your own letter-writing party and we are confident they will pay for themselves in happy customers! In the past, some retailers have charged admission to their event and then included a letter-writing kit in the price of admission, but we would wholeheartedly recommend creating an evening of giving back to your customers through giveaways and letter-writing activations.